Joska Soos in his shamanizing room on the third floor. His book was published in 1985, which was not yet the highlight of Joska Soos’ life as a shaman and an artist. As the interest in spiritual subjects in general, and shamanism as well, was increasing, he started giving lectures and workshops. 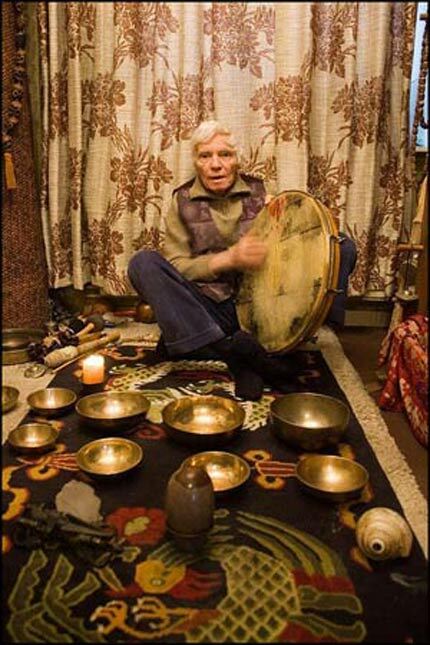 He made sound recordings of shamanic singing with ritual sound objects, one of them related to the seven levels of consciousness, and another to the seven chakras. I met Joska in 1989 when he was 68. He had moved from Brussels to Merksem in Antwerp, with his new girlfriend Monique Franken, the year before. 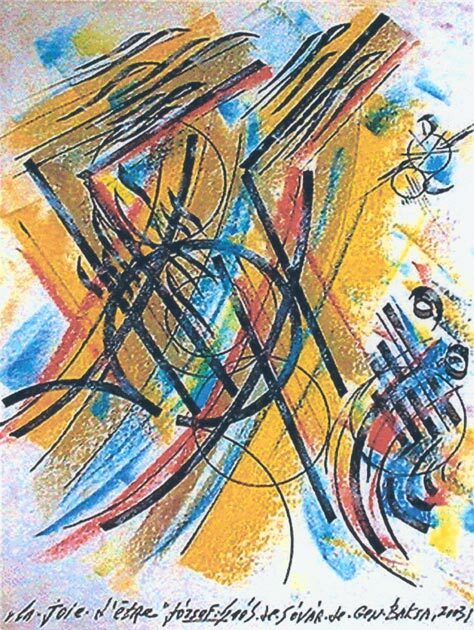 He had mastered air brush painting, which was much more expressive than the drawings he had been making before. His garage was packed with them. 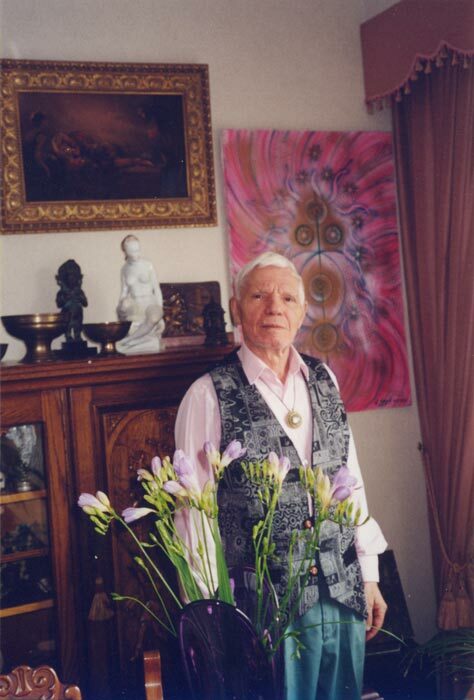 His living room was on the second floor, where besides the paintings, the whole room was packed with Tibetan ritual objects and statues that he had bought from the Tibetan monks in London. These were all old objects, which would now be considered antiques. He showed me copper statues that had the paper spell still sealed inside the bottom of the statues (antique dealers take this out to sell these separately). He had two to three foot long wooden phurba’s (ritual daggers) hanging on the wall. He showed me a human skull plate, covered at one side silver and adorned. These are used to put on one’s head to feel the spiritual vibration of the lama it came from. There was a three-foot wide double dorje made from red copper, that was so heavy that you could not lift by yourself. It came from a Tibetan temple. On the third floor, where he had his little shamanization room, he had a rack full of ritual objects. Large drums with a long handle were hanging on the opposite wall. In the back a huge mala was hanging on a hook, I estimate that the beads were on a eight-foot-long cord. The beads themselves were about two inches long, and had been carved into skulls. The beads themselves were carved from the bones of deceased lamas. In another room he had a lot of singing bowls, pre-1959 (when the Chinese invaded Tibet). They too were old. I bought several of them, and had them later dowsed for their content and age. Three of them dated from the 1800’s. A small carpet in front of the door of his shamanization room had images of skulls on it, how fitting to welcome a visitor! Visiting Joska Soos at his place was always like going into wonderland. When I left the house through the front door, it was as if I was stepping from another dimension back into the everyday world. He always listened carefully to my questions, and gave me a lot of insight. Whenever I called him on the telephone, or when I was at his place, he was always singing with guttural sounds. He also explained me how to do this, and how to sing a mantra without words. On August 15, 2008, Joska Soos left his physical body behind. He was 87 years old. Joska Soos, the man, his art work and his spiritual message should not be forgotten! Joska in his living room, on the second floor of his house.